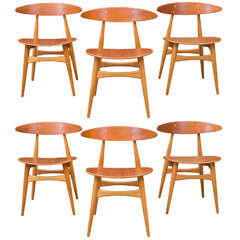 Set of Mid-Century Modern Drexel Declaration Dining Chairs by Kipp Stewart. 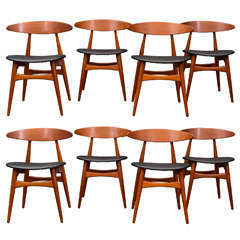 Mid-Century Modern Kipp Stewart design dining chairs for Calvin. Perfectly refinished walnut frames, newly upholstered in off white linen fabric. Very comfortable and ready to enjoy. 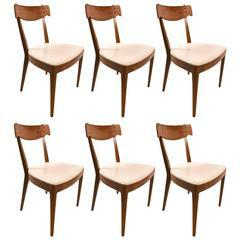 Set of six Danish modern teak dining chairs, in very good to excellent condition. High quality construction with a Minimalist design aesthetic. 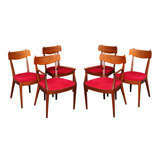 Franco Albini designed dining chairs for Herman Miller. Adjustable backs, maple frames in very good original condition. Reduced in price from list $8800.00 to net $5,800.00. 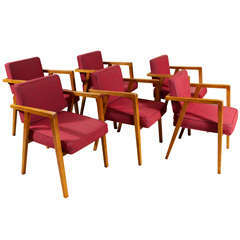 Rare and large original set of CH-33 dining chairs by Hans Wegner for Carl Hansen & Sons. Refinished with excellent condition original vinyl upholestry labeled. 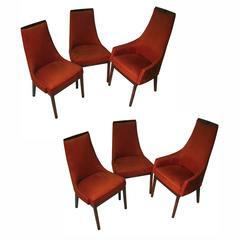 Set of 4, Mid-Century Modern, dining chairs by Kipp Stewart for Drexel feature walnut frames with newly upholstered seats in black jacquard. 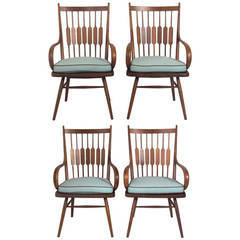 Set of four modern windsor style dining chairs designed by Kipp Stewart and Stewart MacDougal for Drexel Furniture, American, circa 1960s.